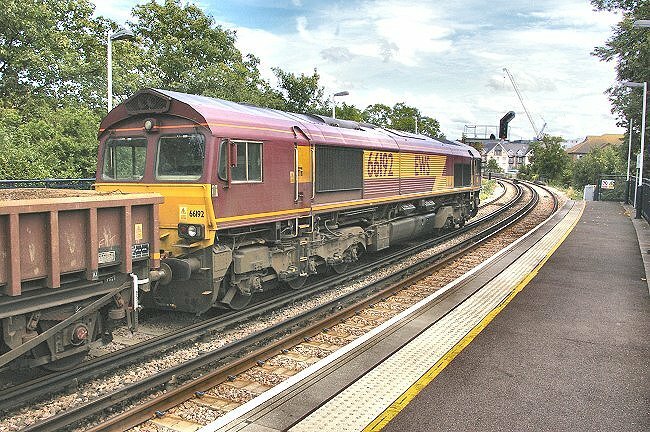 EWS locomotive 66192 waits to enter Hampton Wick station. 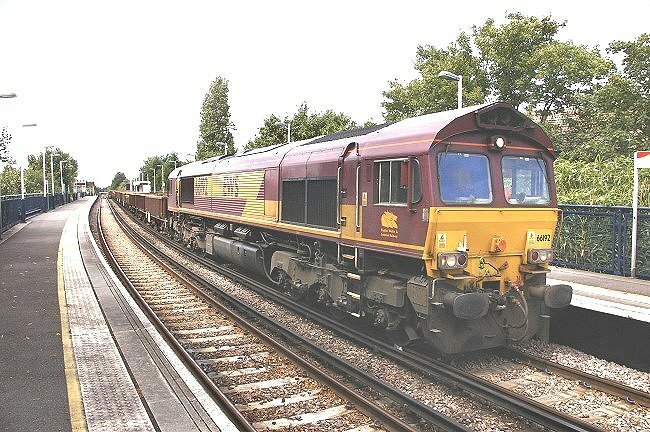 This is train 6N44 from the engineering work at Shacklegate Junction, bound for the yard at Hoo Junction in Kent. The train was formed of 27 four-wheel wagons (furthest from the camera) plus 4 "Falcon" type bogie wagons of TOPS code JNA (nearest the camera). Photograph taken from Bushy Park Road footbridge. The buildings on the horizon are in Kingston town centre. 66192 then brought 6N44 forward into Hampton Wick station, where it came to a halt for a few minutes before setting off to Hoo Junction. 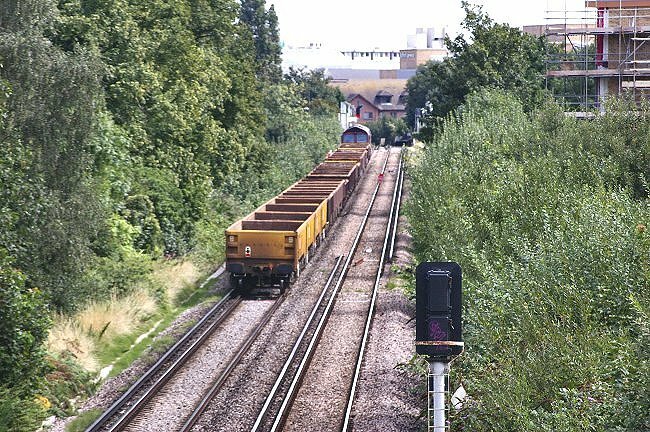 Photograph taken looking towards Teddington. 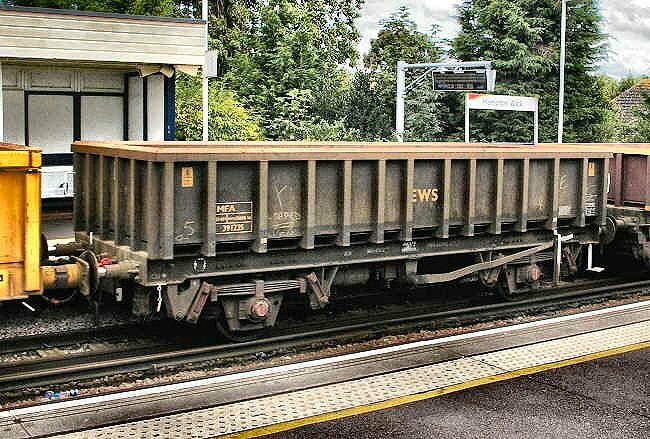 A portrait of 66192 whilst waiting at Hampton Wick station. 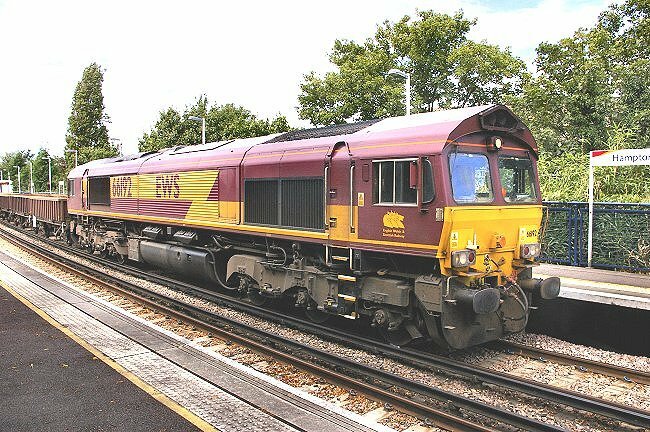 EWS locomotive 66192 waits in Hampton Wick station for the signal to clear. The first wagon in train 6N44 was number 394344, TOPS code MHA. This was originally built as a Merry-Go-Round coal hopper. 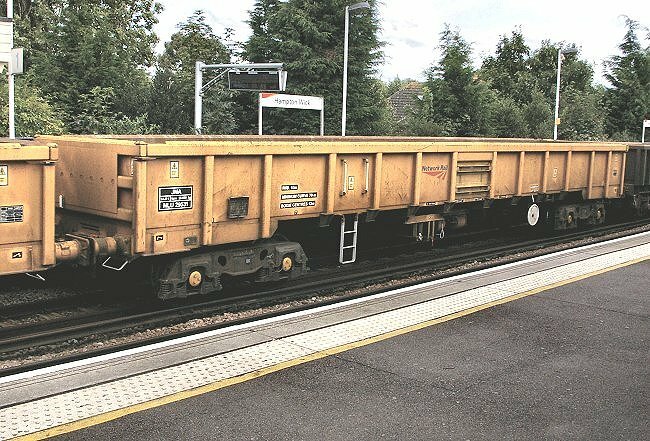 When it was no longer needed for coal traffic the hopper body was removed and the chassis was re-used to create an open wagon for engineers use. There were twenty-one MHA wagons in the train. 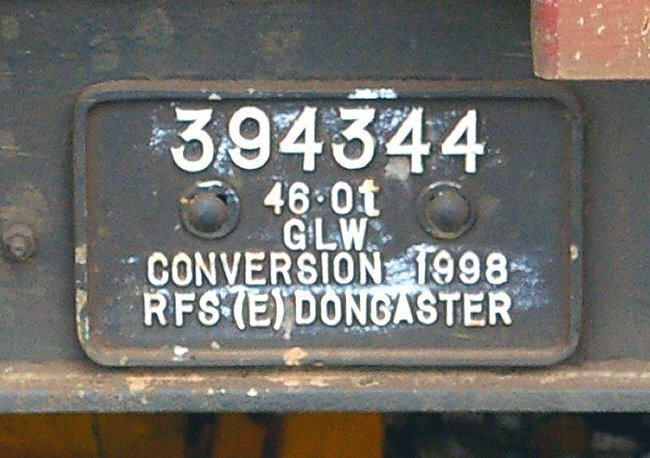 The makers plate on MHA wagon 394344 shows that it was converted by RFS at Doncaster in 1998. There were five MTA type open wagons in the train, this example being 395398. There was just one MFA type wagon in train 6N44. Wagon 391235 was built on the re-used chassis of wagon 360039. There were four "Falcon" type JNA bogie wagons at the rear of the train. 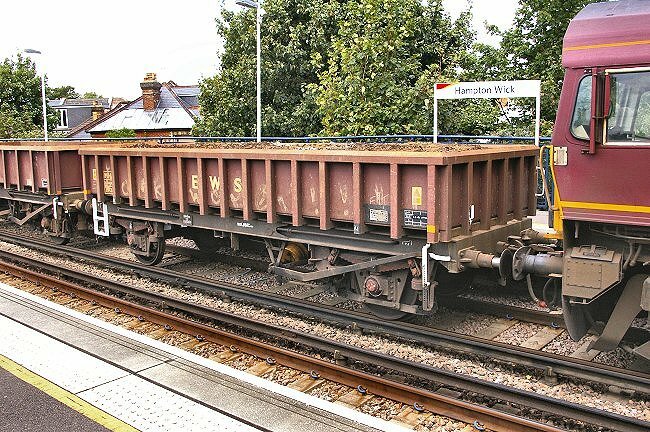 This is private owner wagon NLU 29531, belonging to Network Rail's National Logistics Unit. 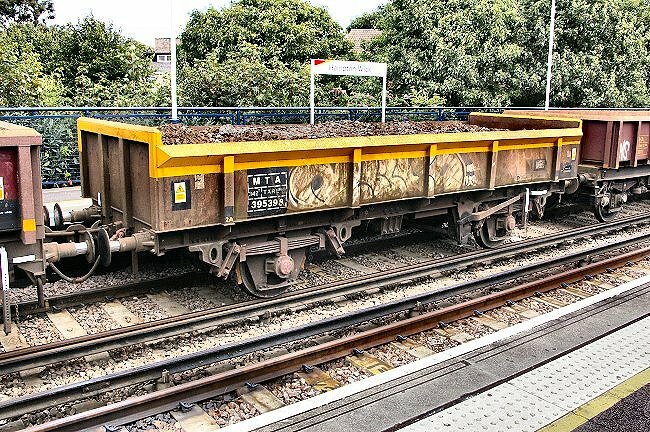 This fleet of wagons were built by Astro Vagone at Arad in Romania between 2003 and 2005.